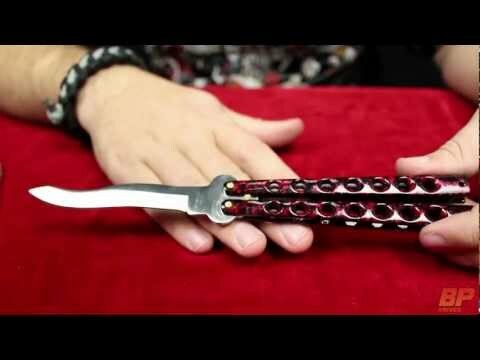 The Flick is a low-cost butterfly knife that makes a great user or practice knife. The polished silver handles are skeletonized for weight reduction and a great look. The stainless steel clip point blade is high satin finished. Training Tip: Put electrical tape over the edge of the blade while you're learning to swing and whirl your way to fame and fortune. Honestly, I could not be more happier with the product. Perfect and exactly what I wanted. As many other people, I had trouble with the latch. I took this on a float trip after I sharpened it and after hours of use, the latch just flew off. I would say it is worth buying, because of the current 5$ price, but save up for a real knife if you can. One worth at least 60$. 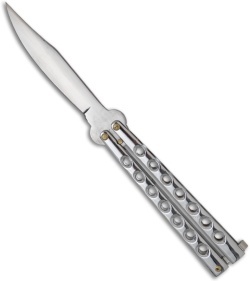 Its a 5 dollar knife. The pins may be loose and its dull out of the box. But its cheaper than most of the trainers on here and has some nice weight to it so its perfect to practice with. I got a few for friends and a couple for myself. This is a knife that you can tell was $5, but the black ones have a slightly higher-quality feel than the silver ones. Very light, which makes them a nice trick knife, and the blade is just sharp enough to teach you which side is the right one without lopping off a finger. Not nearly as high of a quality as the scoundrel, but hey, it's $5 so why not. A nice staple to add to your order in case your other knife breaks. Not a permanent knife, but a great price for a beginner's knife. Is a 5 Dollar Knife Worth It? I am a little worried about the pins they seem loose. But you are only paying 5 bucks for it so its good for 10 bucks. Super nice flipper and it came in three days 1 day before it was supposed to! Thanks Bladeplay! I just received this knife and it works wonderfully! Although the blade is dull, it is an amazing beginner knife. I just want to know if I need to put a threadlocker on this. Decent nice fast shipping. What can I say for the money this is an incredible deal. I didn't know if I wanted to spend the money on and expensive flipper so I bought this one. The shipping was incredible, delivered to my mailbox in four days. The knife itself is a very simple inexpensive flipper from China, great to become reacquainted with the art. I will be making a new purchase today and will continue with this knife for practice. I highly recommend this knife to see if you would like to invest money in a more expensive flipper. Flips nice and has great weight too. It only get's a 2 from me though because it came extremely dull. Flips nice, the pins are much better than screws, a good stater knife, blade is not to sharp I don't mind to much, over all I love this knife I don't have any problems with it at all, good for the price worth for the money. We're sorry to hear of your experience. Please contact customer service and we'll be glad to take care of this for you. 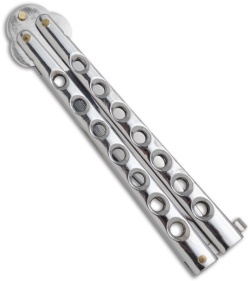 In general these butterfly knives have proven to be reliable. I ordered two of these. They arrived in a timely manner. They are very rugged and sharp knives. They feel very comfortable in the hand.. I use a mini mag sheath to carry it on my belt.. It fits perfectly as if it was made for it.. I use mine to cut up boxes which is slices through like a hot knife through butter.. There is a sharp edge on the back of the blade that should be filed down if you are going to open it with one hand so you don't cut your finger on it.. Other than that it's s great knife for a great price! This knife came in about 4 days so shipping was awesome, came exactly as advertised. Was Smooth and fast and I loved the rivets. Screws have always failed and pissed me off in moving knife parts so that's a plus. The knife seems a little loose and floppy when in motion or even slightly when closed but when latched and open it is very surprisingly sturdy. I love this knife for this price. Blade play, you have another avid buyer. Love this site. I got this and it broke within 2 days of me having it. It says stainless steel for the handles but it is more like pot metal which is super super cheap metal that has no structural integrity. We're sorry to hear your knife broke and in rare instances where this occurs we are happy to replace the knife. The handles are not stainless steel- we apologize for the error.